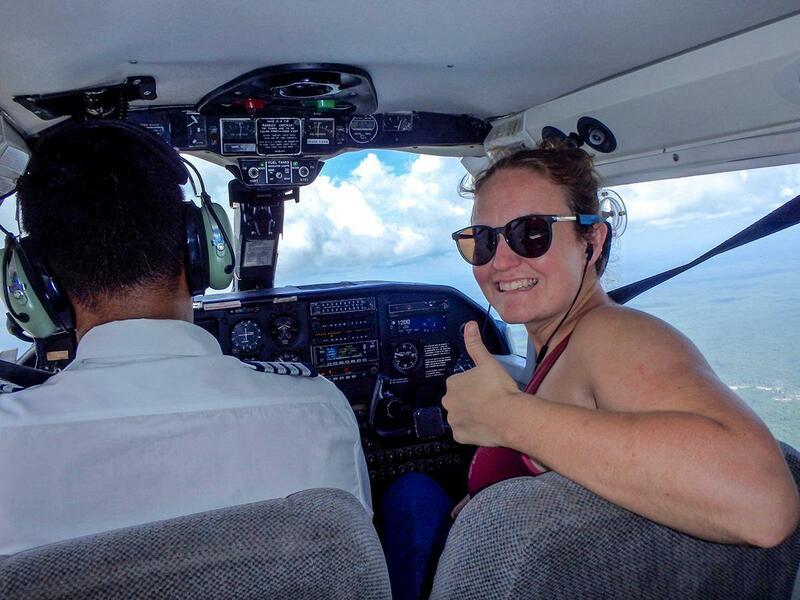 Emily takes us soaring over the Amazon Jungle to view Kaieteur Falls, one of the most spectacular natural tourist sites in Guyana, an undiscovered gem in South America. 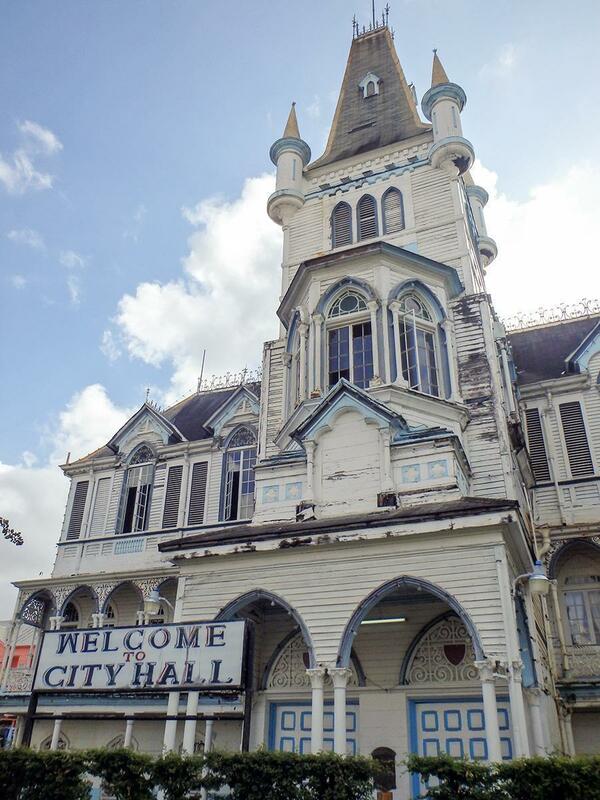 [Editor’s Note:] When Emily contacted me about guest writing for CheeseWeb, I was excited to learn she had recently visited Guyana. As my trip to French Guiana was one of my most memorable travel experiences, I was intrigued to read about its tiny neighbour. This part of South America is still relatively undiscovered by tourists but is well worth the extra effort it takes to visit. 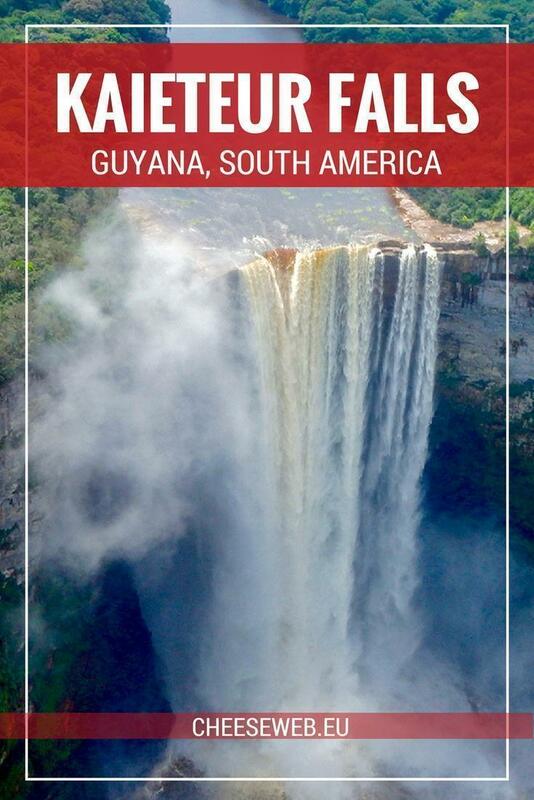 Read on to learn why I’ve just added Guyana to my own travel bucket list. 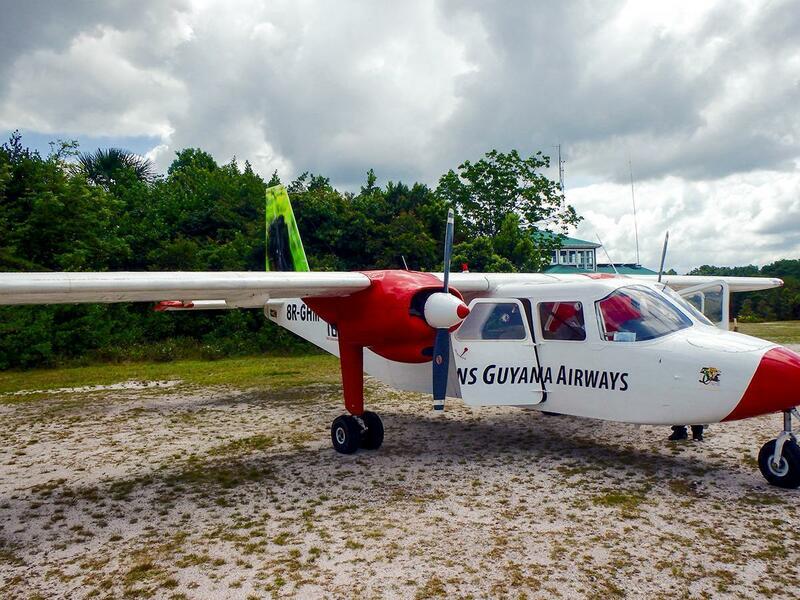 Not many people have travelled to Guyana, probably because not too many folks have Guyana on their bucket lists. It is an English speaking, Caribbean’ish country in South America. 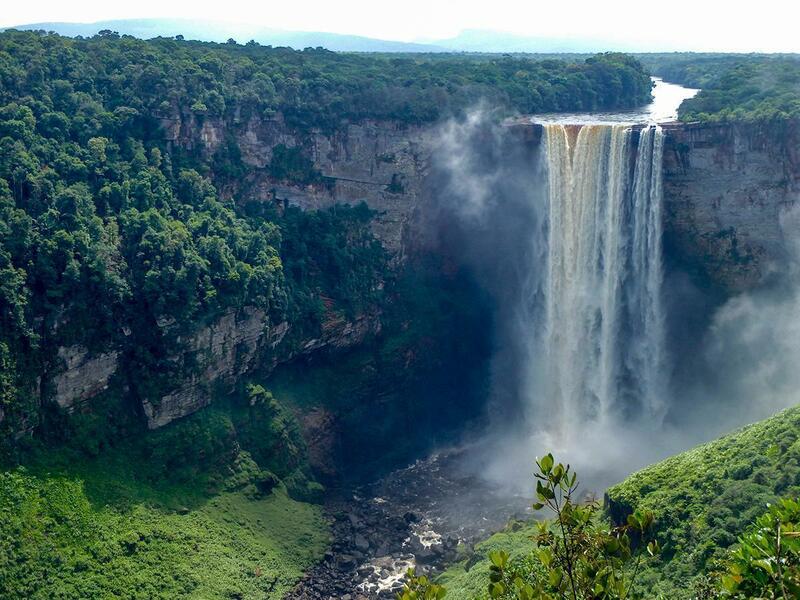 Guyana is a developing country and has low tourism numbers, but it really shouldn’t. 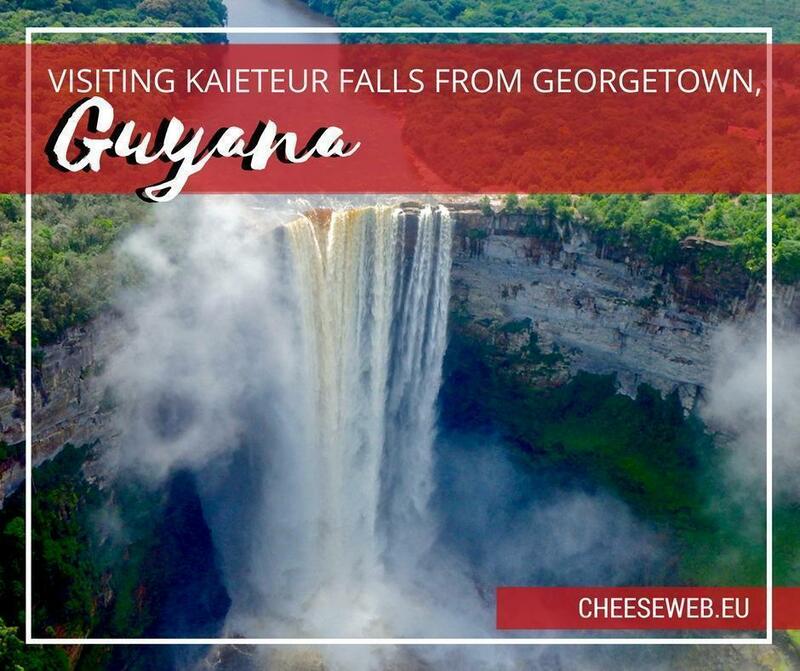 Not only is Guyana arguably one of the least touched, naturally beautiful countries around, but it is also home to a charming capital city and one of the world’s tallest waterfalls, Kaieteur Falls. Guyana and it’s capital Georgetown was colonised in the 17th century, first by the Dutch, then the British, then the French, then the Dutch again, and finally the British again until independence in 1966. Given this back and forth of history, in addition to the indigenous tribal history and cultures, modern Guyana itself is, to this day, very eclectic. Wandering the streets of Georgetown, I couldn’t help but be charmed by the diversity in housing, ranging from modern concrete to colonial wood slating. Gardens are well kept, be they public or private, and City Hall, the Starbroek Market, and the Court House all have slightly different colonial airs to them (and are in various states of repair). A quick visit to the market had me to chatting with several very pleasant women, from one of whom I bought socks, as well as young gentlemen who sold me some meat marinade sauce that his wife made. When I asked him what was in it, he didn’t know, but he said it was really good. Sold! 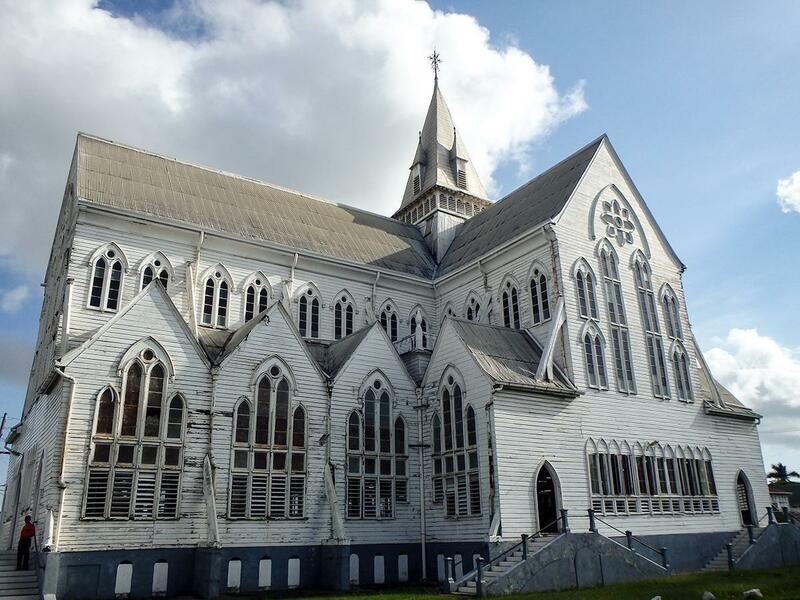 One of the most significant sights in Georgetown is St. George’s Cathedral. 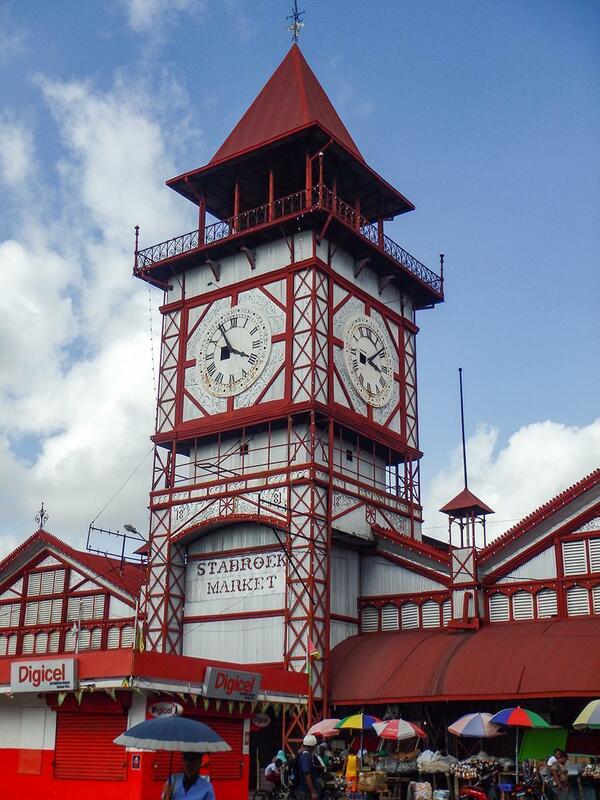 Built in 1842 and standing at 43 meters high, St. George’s is one of the tallest wooden churches in the world. Being Sunday morning, I stepped into the phenomenal Anglican Church along with the better-dressed regulars and enjoyed the sights and sounds of a Sunday church service. As impressive as the church is from the outside, it is monumentally more so while sitting inside. The harmonies of the hymns bounce off the dark pitchpine ceilings, while the Queen Victoria-gifted chandelier and the stained glass windows shed light on the faithful in a variety of colours. Despite the interesting bits to see in Georgetown, it is not a large city, and after half a day I had generally seen it all. 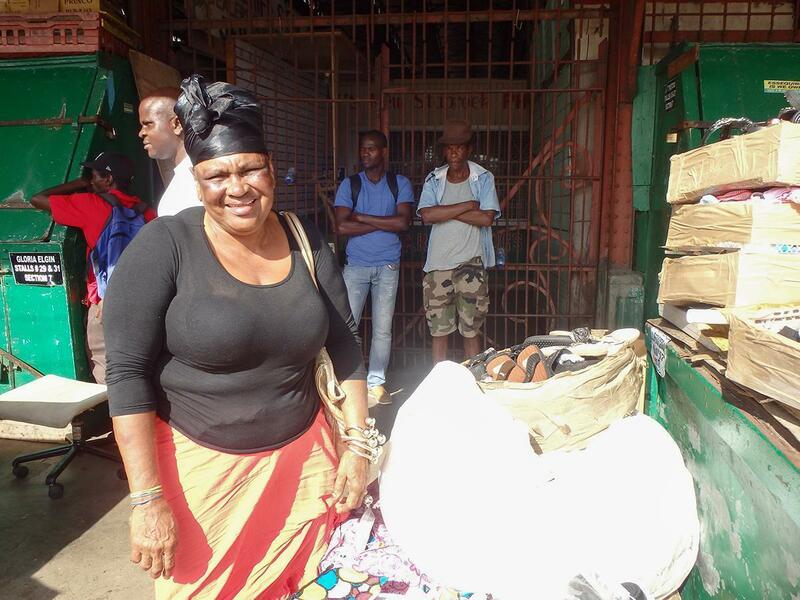 Speak to most Guyanese, and they will tell you to get out of Georgetown and head for the jungle. 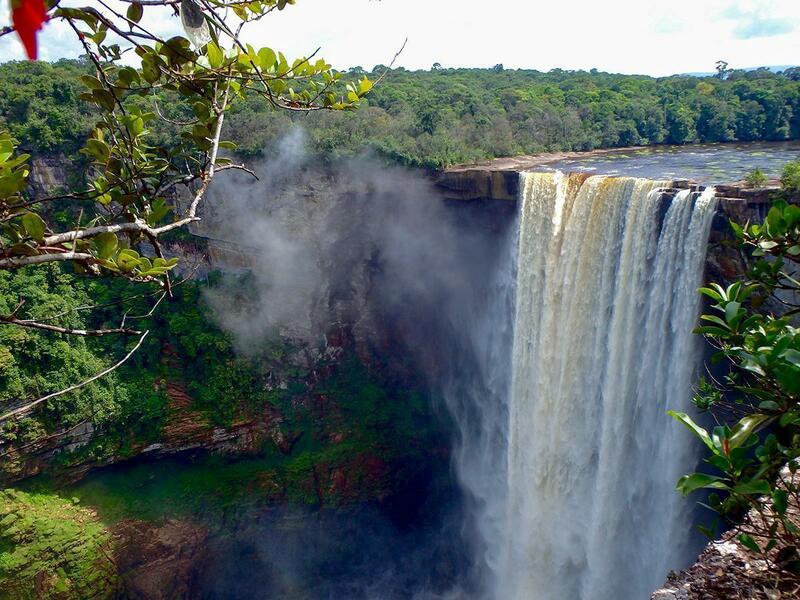 The most striking and popular destination for any jungle-bound visitor is a day trip to Kaieteur Falls. I say a day trip, as most visitors will hop the hour long flight inland as opposed to the five-day overland voyage. 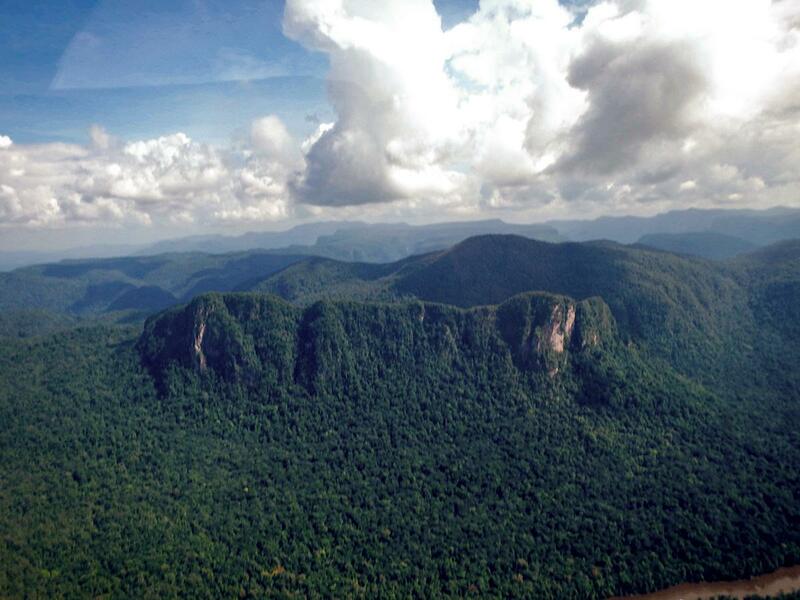 Having limited time, I too opted for the flight and swiped my credit card for a day soaring over Guyana’s Amazon Jungle and up onto the Potaro Plateau to see the great Kaieteur Falls. Flying low, the jungle beneath appears to be a blanket of every shade of green laid over the curves of the earth, so pristine is this part of the world. 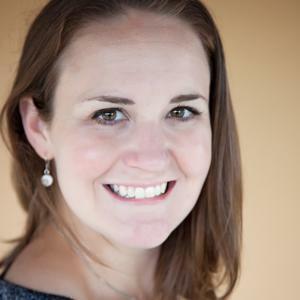 After an hour in the air, the plane nears the ground as it glides over the Potaro River Valley and then suddenly Kaieteur is dead ahead as if simply risen from the earth. The pilot did an impressive flyover, to give the six other waterfall explorers and me some perspective of how huge this drop is. 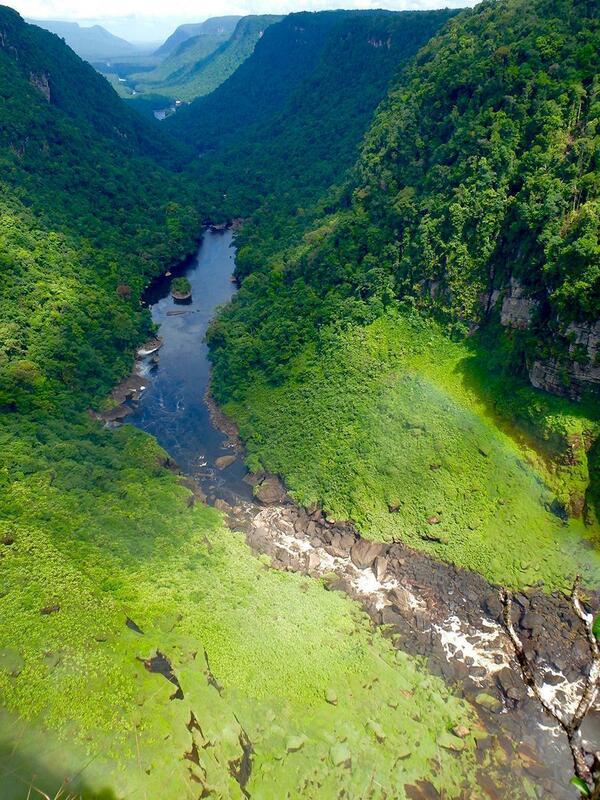 Even from the air, the Potaro River going over that cliff and plummeting the 226 meters in a single drop dwarfed us. The jungle surrounding Kaieteur Falls is practically untouched, with no development or even village habitation for 50 miles. After we had landed on the Kaieteur airstrip, perhaps one of the more remote airstrips in the world, we met with our guide. Troy toured the group to three different lookouts to view the falls. The first viewpoint was the furthest away and required a bit of a hike through the slippery and humid jungle. I, of course, am an over prepared nerd, so I was suitably dressed in yoga pants and running shoes. Other members of the party were less well attired and had a slight issue with the tricky footing. But all well, we made it to the first viewpoint to fully take in the Falls from the widest perspective. The scale of Kaieteur Falls is truly magnificent and like one I had never experienced. The second and third lookouts brought us closer and closer to the falls but also provided better views north up the Potaro River Valley. 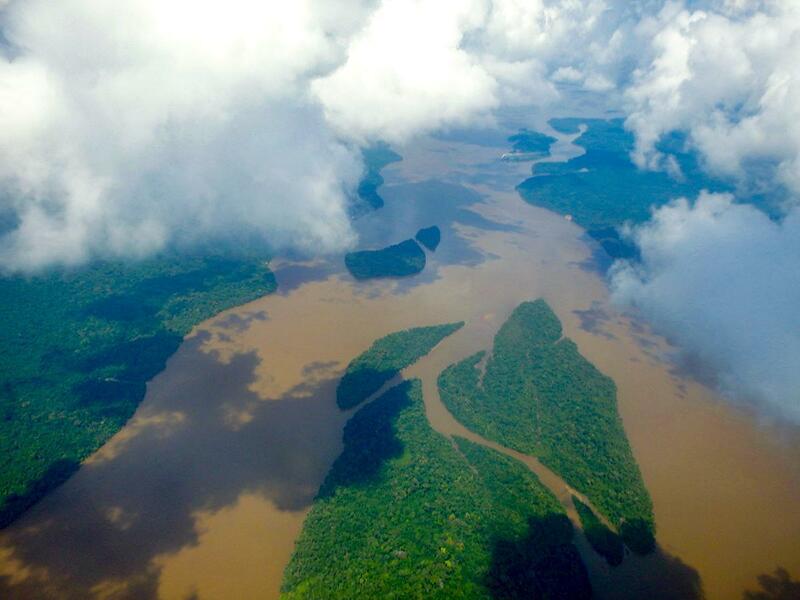 Appearing to have been cut through the earth with a jagged knife, the Valley that starts with Kaieteur flows for as far as one can see and will eventually empty into the Essequibo River, Guyana’s longest river. Close to the Falls, I could feel the pounding of the water reverberating through the rock bed on which I was standing, making me even more cautious to keep a healthy distance from the edge. 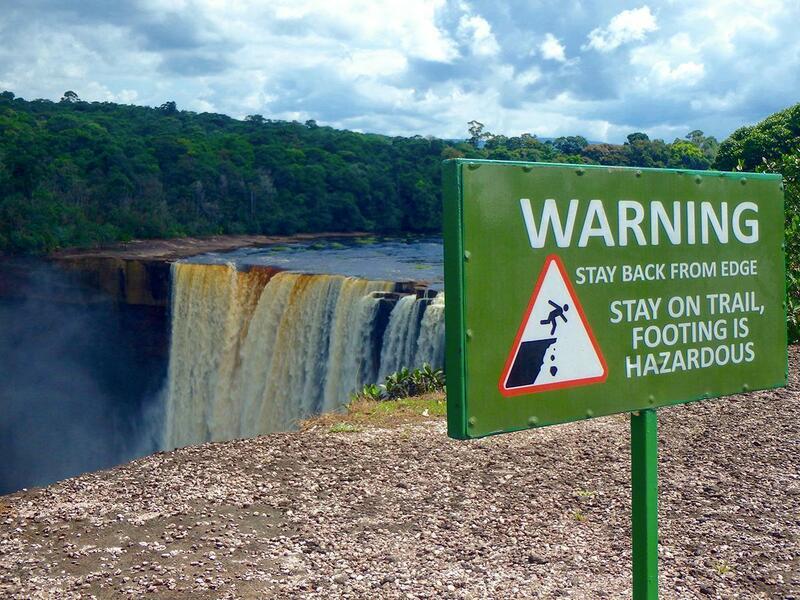 No guardrails in Guyana, the extent of the safety precautions was a sign implying if you fell it was a long way down. 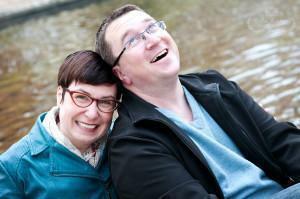 Normally I am a fairly frugal traveller; “budget” is my typical spending category. But for the trip to Kaieteur Falls, I had to blow the budget. A once in a lifetime trip into the Guyanese jungle to experience a spectacularly remote and magnificent natural wonder is not one a true explorer passes up lightly. As the plane took off (I sat in the co-pilot’s seat on the way back! 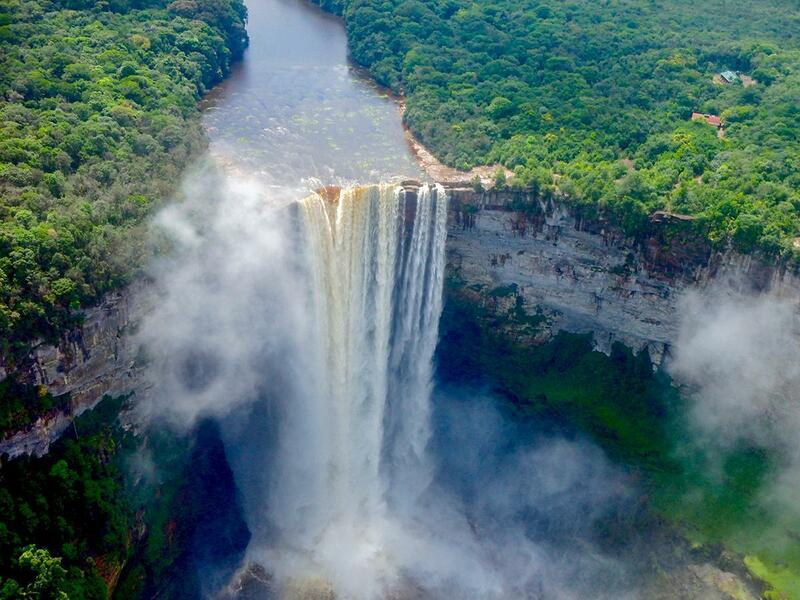 ), we did one more swoop over Kaieteur Falls and, camera down, I focused on imprinting the sight into my conscience. Guyana is nothing if not incredibly memorable.